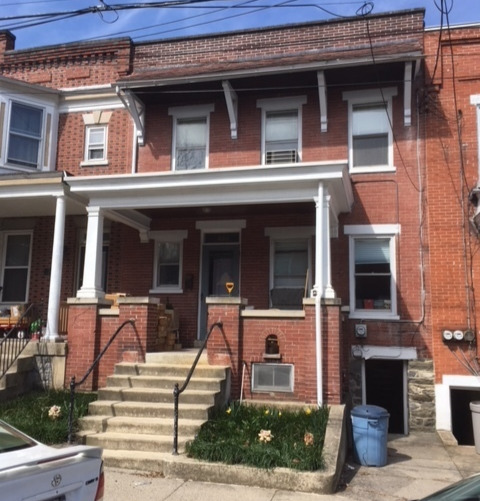 This affordable, conveniently located all brick house in Lancaster city will be sold by public auction. There will be a separate online sale for the personal property (including lots of books) on a date to be determined. The first floor consists of eat-in kitchen, large dinning room, family room, 2 large fireplaces, & hardwood doors in house with original stained glass windows. The second floor has 3 bedrooms with plenty of closet space, 2 bonus rooms, & full bathroom. Other features include hardwood floors throughout the house, large basement for extra storage, oil hot water heat, covered side porch, off street parking out back, & is within walking distance to F&M college & uptown. This home offers tons of historic beauty that could be brought back to life. Great investment property! 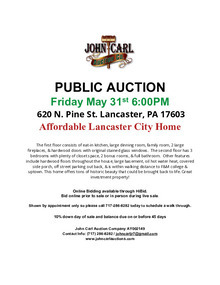 Download "Lancaster Pine St. RE.pdf"